Micromax has started rolling out the Android KitKat updates to its product range. The latest handset to get the latest update is the Canvas 2 Colours A120. 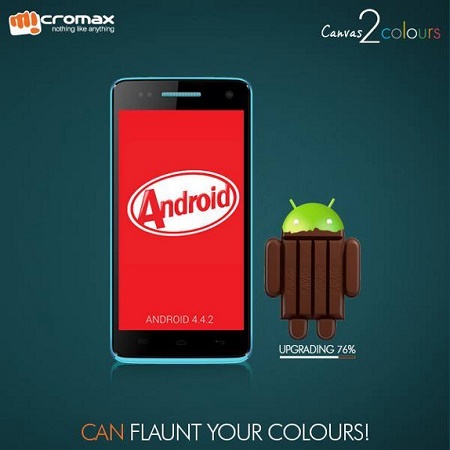 Micromax has announced the rollout of the Android KitKat v4.4.2 for the Micromax Canvas 2 Colours A120, which was launched earlier this year running on the Android Jelly Bean v4.2. The update measuring juts 283 MB is being rolled out over the air (OTA) and users are expected to receive the update by the end of the week. The Android KitKat v4.4.2 update for the Micromax Canvas 2 Colours A120 emojis, printing support, performance tweaks and some UI changes. There are also some other regular performance updates. Micromax has promised to release the KitKat update to many of its devices by the end of the year.